Would You Give $37 Million to a Guy You’ve Never Met? In 2014, the Denver Broncos hosted the Houston Texans for a couple of days of practice during training camp. At one point during the sessions, Texans coach Bill O’Brien sidled up to the Denver quarterback group to speak with Peyton Manning and got to meet his backup, Brock Osweiler, briefly. Just a quick hello. Until Osweiler signed with the Texans on March 9, that 10-second niblet of time was the extent of the personal interaction between the quarterback and the three men most important to his success in Houston. The owner, Bob McNair, agreed to guarantee $37 million to Osweiler without ever meeting him. The head coach, O’Brien, never got to speak to Osweiler during the free-agency period, to look him in the eye and find out if he was the man O’Brien wanted to build his offense around. The hands-on offensive coordinator, George Godsey, never got to drill Osweiler on his strengths, weaknesses and how he might fit into the Houston scheme. But it’s not as if the Texans brass were being reckless with such a critical decision. It’s that league rules forbid any direct contact between a player and a prospective team before the official opening of free agency. That Houston signed Osweiler to a $72 million contract without actually interviewing him and getting a feel for the kind of person he is … well, it’s insane. It’s like Warren Buffett hiring a CFO for Berkshire Hathaway by watching a couple of appearances of the candidate on “Squawk Box” and “Mad Money,” then committing $15 million a year to the hire. I was going over all the various shirt-pocket notes (an old expression by the former Steelers radio voice, Myron Cope) from the league meetings just ended, and my conversation with O’Brien on this subject really stuck out. Here’s a third-year coach of a rising franchise, a bright guy with quarterbacks, a branch of the Bill Belichick coaching tree, and he just made a decision with far-reaching and quite stark consequences. If he’s right on Osweiler, and the Peyton Manning protégé turns into a pretty good player, Houston should be a contender for the AFC South crown for several years to come. If O’Brien is wrong on Osweiler, the decision could cost O’Brien, his staff and other Texans scouts and front-office people their jobs. It’s inconceivable to me that the NFL would think this impersonal disconnect is a smart way for teams to do business. Should there be a visiting period before the official start of free agency, to allow players like Osweiler to meet with interested teams? Would owners hire coaches without meeting them? Would Roger Goodell hire a league vice president without meeting him or her? In either case it would be football malpractice. Contrast the free agency rules to the draft process. Each NFL team can host 30 players at its facility and put those prospects through a battery of non-field tests and interviews. This was one way in which then-Bucs offensive coordinator Dirk Koetter got comfortable with Jameis Winston a year ago; during Winston’s visit, Koetter challenged him, saw that Winston responded well to it, and reported to GM Jason Licht that he liked what he heard and saw out of the quarterback. Tampa Bay was probably going to take Winston anyway with the first pick, but the interaction between Winston and the man who would coach him daily was a piece to the puzzle that was vital for Licht. A free-agency visit system would not be difficult to organize. Four or five days before the start of free agency, the NFL would set up a legal tampering period for agents, teams and players. No player would be allowed to sign a contract before the opening of free agency, though agents and teams could discuss terms. Currently, there is a 52-hour window—two days and four hours—in which agents and teams can talk about a free-agent player’s services. But the player himself can have no contact with anyone from a team other than the one he just played for, until the free-agent market opens. There’s a reason for this—it’s to give a player’s most recent team every chance to re-sign him. Laudable, to a point. But does a team need nine full weeks to try to re-sign its own player? That’s the length of time between the end of the 2015 regular season and the beginning of the legal tampering period, when agents and other teams can legally communicate but players can’t. There’s no need to take all that time. Why not shorten that period to eight weeks? It would hurt nothing, and would allow a few days for players to visit prospective teams and meet the head coaches and position coaches they would have to work with. It’s not going to be a perfect system. But what if a player like Osweiler has some little idiosyncracies that turn a prospective new coach off, and may turn off some of the teammates he’s being asked to lead? You might not be able to find out everything about a guy in a visit of a few hours, but you’ve at least got a fighting chance to test him. I defy you to find one coach or owner who likes a system that has them doling out millions of dollars to people they know less than a practice-squad tackle signed in Week 16. Players would also get a better idea whether a particular team and its staff is the right fit for them. O’Brien did as much fact-finding as he could on Osweiler. He watched tape of every game Osweiler played in Denver. He grilled Osweiler’s college coordinator, Noah Mazzone, who loved Osweiler. He paid attention to the impressive game Osweiler played against New England on a Sunday night in crunch time. He was sold, and told owner Bob McNair and GM Rick Smith he really wanted Osweiler. Smith did the deal, and three hours before the market opened, Osweiler sent word to agent Jimmy Sexton that he was picking Houston. Sexton then called the Texans. Even at the moment Osweiler committed to the Texans, he couldn’t talk with them. There’s one more roadblock to the Texans staff and Osweiler getting to know each other quickly. Upon signing, Osweiler was allowed to have a press conference in Houston, meet his new bosses and have short non-football sessions with them, but under the terms of the 2011 collective bargaining agreement, there can be no football classroom sessions until the start of the Texans’ offseason workout program, on April 18. The first two weeks of the program are limited to four hours per day, mostly strength and conditioning work. 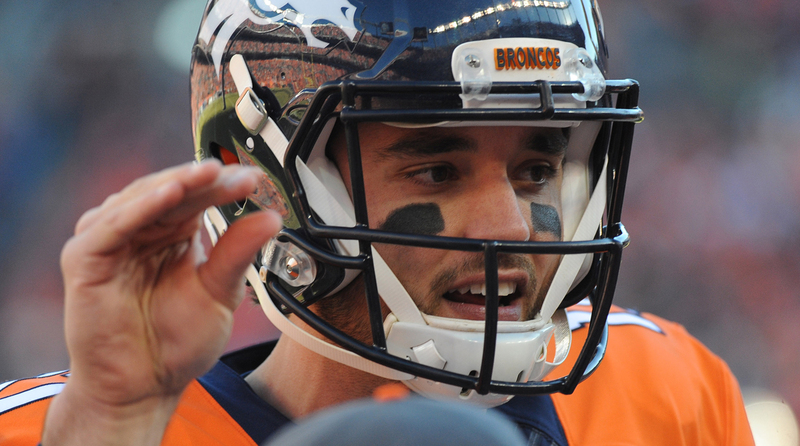 On May 2 Osweiler will start three weeks of on-field and classroom teaching sessions. Then, beginning May 23, the Texans have four weeks of non-contact practices and classroom sessions. After that, the players are dismissed for five weeks, before training camp starts in the last week of July. “So we’ll have nine weeks [plus camp] to get him ready,” O’Brien said. O’Brien was allowed to give Osweiler the team’s playbook (on a team-issued tablet) to study, but the coach can’t have any contact with his new quarterback until the offseason program begins. So for five full weeks after signing, Osweiler can’t call Godsey or O’Brien with questions about nomenclature or offensive philosophy. • QUESTIONS OR COMMENT? Email us at talkback@themmqb.com.